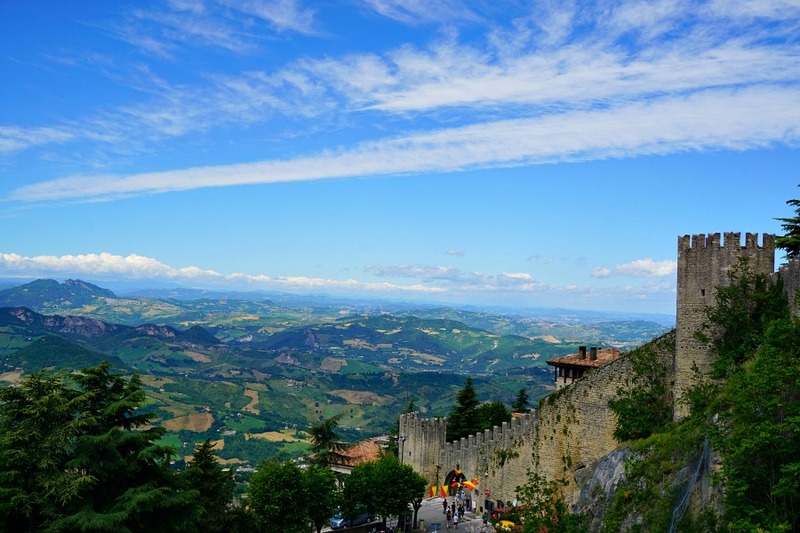 San Marino is the third smallest country of Europe. 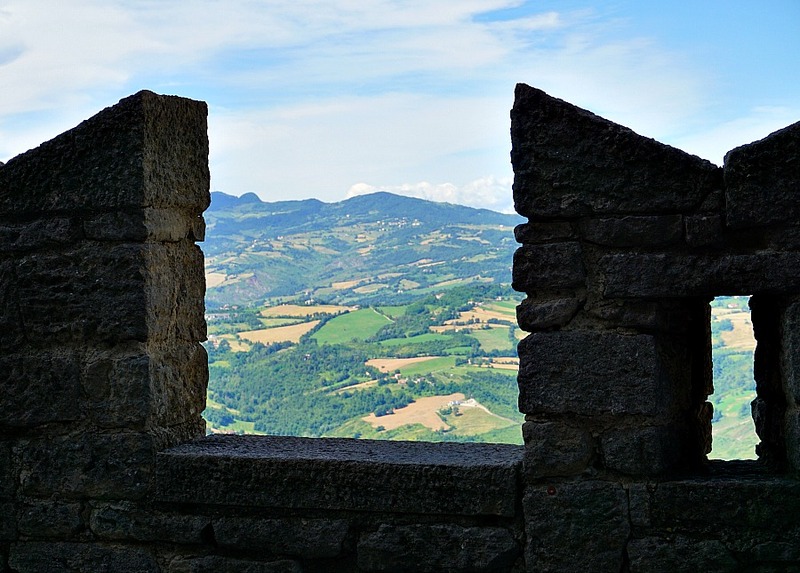 And that’s not the only distinction – the tiny country is perched on the Apennine mountain range and is completely surrounded on all sides by Italy. They have maintained this precarious position since 301 AD, earning themselves the bragging rights as being one of the world’s oldest independent constitutional republics. Quite a feat for a country that is a mere 24 square miles in size. In the 1700 years since it’s founding, conquerers (including Napoleon) invaded the region, but decided to leave the microstate of San Marino to its own devices. 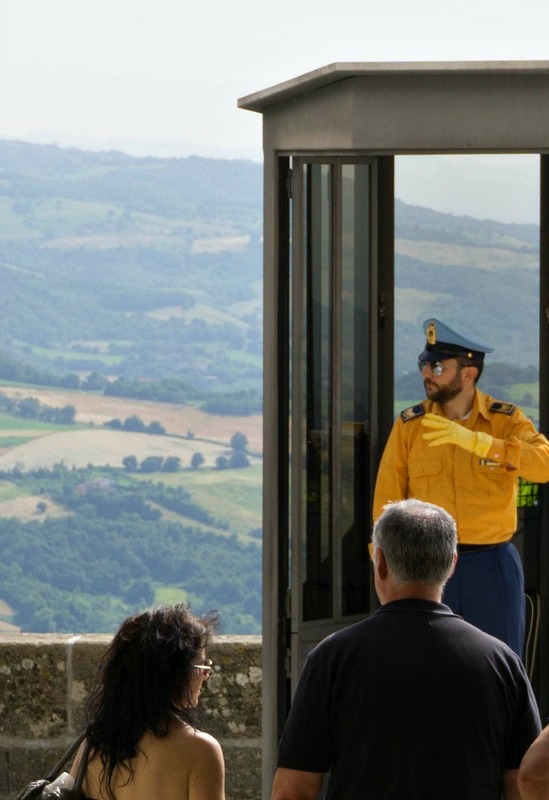 So whatever you do, don’t call the citizens of San Marino “Italian” or you will be politely but firmly corrected. This is one of the facts that makes is such a wonderful place to visit. Here are a few more that may just inspire you to make the trip. 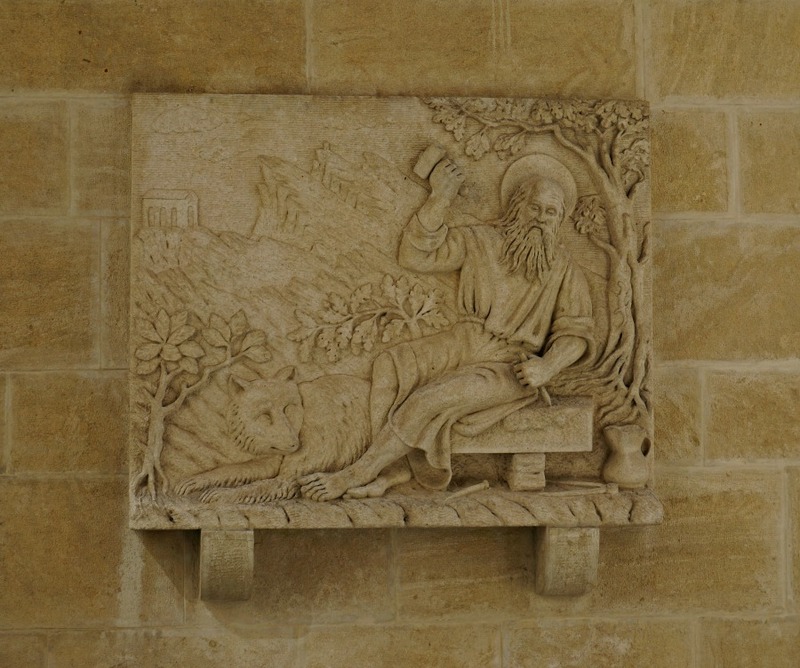 San Marino is said to have been founded by a stonecutter named Marinus on September 3, 301 AD. Marinus’s migration was the result of persecution for his Christian beliefs by Turks who invaded his homeland, the island of Rab. The founding principles of religious freedom and separation of church and state remain a central value in the community. But how did the tiny country, currently with a population of about 31,000 citizens, remain independent? 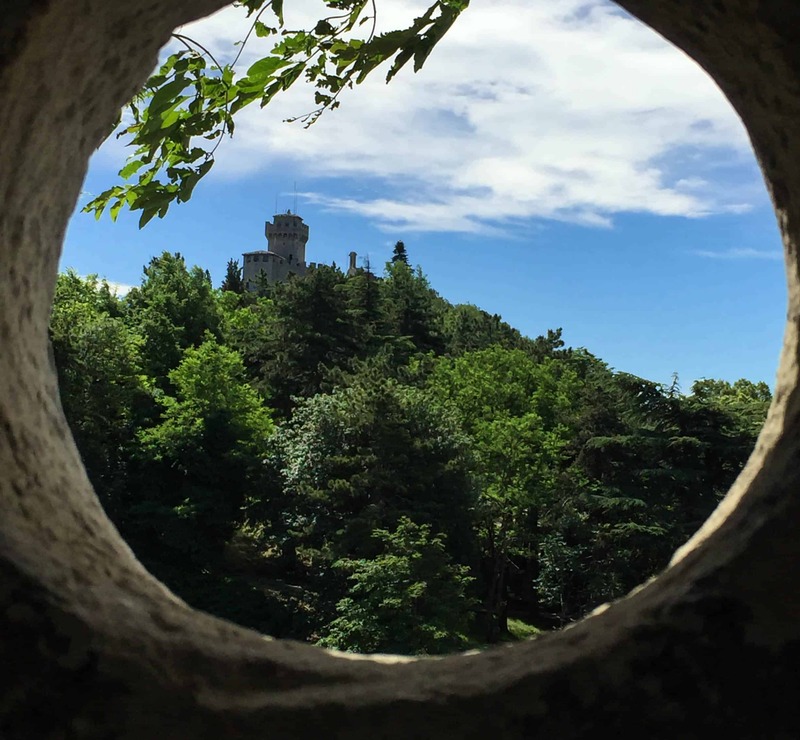 The three towers that dominate the view of San Marino from below tell part of the story. There are many symbols of the famous crossbows which were used by skillful archers from high atop the tower walls to protect the city. A second part of the story is a bit more intriguing. The leaders of San Marino are reputed to be excellent diplomats. This diplomacy and friendship forged with Napoleon Bonaparte is one reason that he decided to keep his troops out of the small country while he took over all of the territory surrounding it. 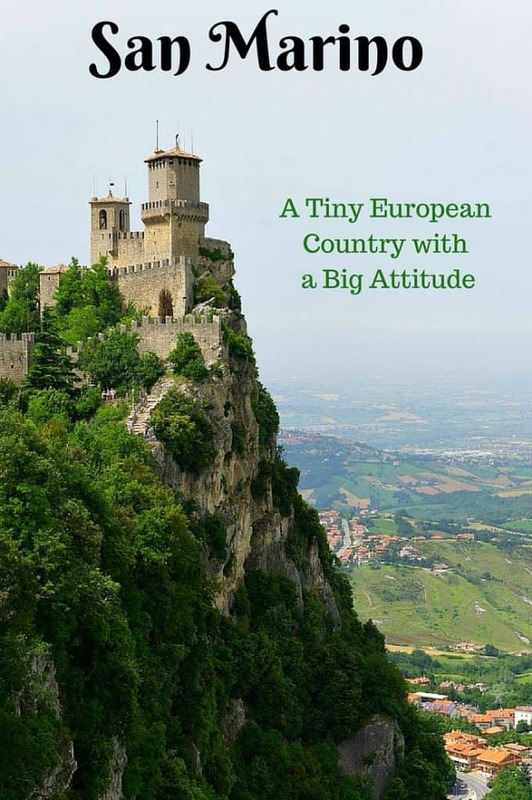 Lastly, San Marino has decided to stay small and do what they do best. 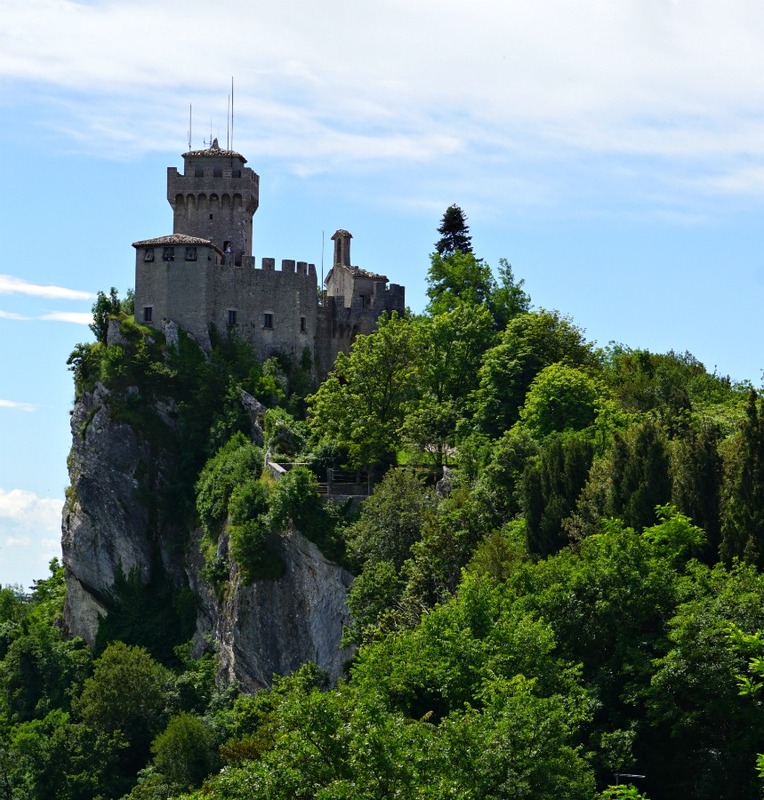 When Napoleon offered additional seaside territory to be annexed to San Marino, it was politely refused. Having to defend a mountain is one thing, coastal property – quite another. There is something romantic about castles. Visions of ladies in long gowns and valiant knights battling to protect the fortress come to mind. San Marino has festivals every year with reenactments to celebrate their medieval past. You can just imagine knights with their crossbows fending off enemies from the city walls. Or you can visit when one of the festivals in progress by checking the Board of Tourism website. 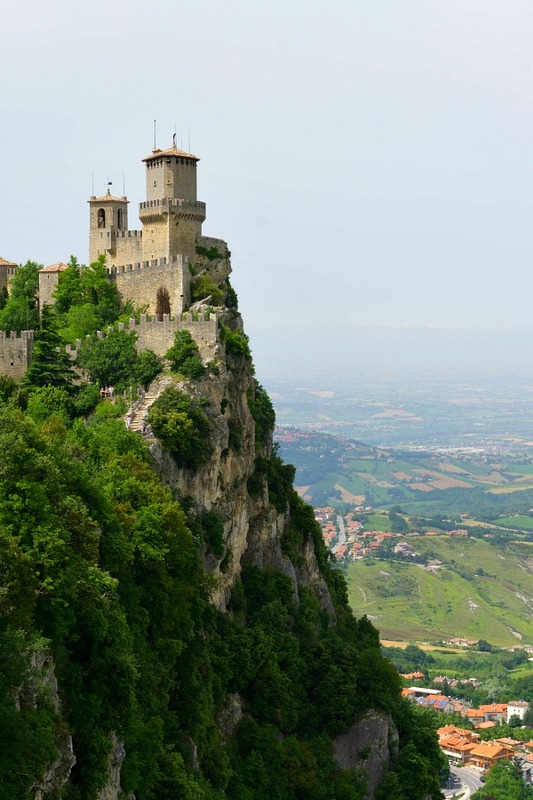 San Marino has three towers, Guaita, Cesta and Montale, together known as the three pinnacles. You will see the three towers depicted together on flags and plaques as an important and unmistakable symbol of the country. 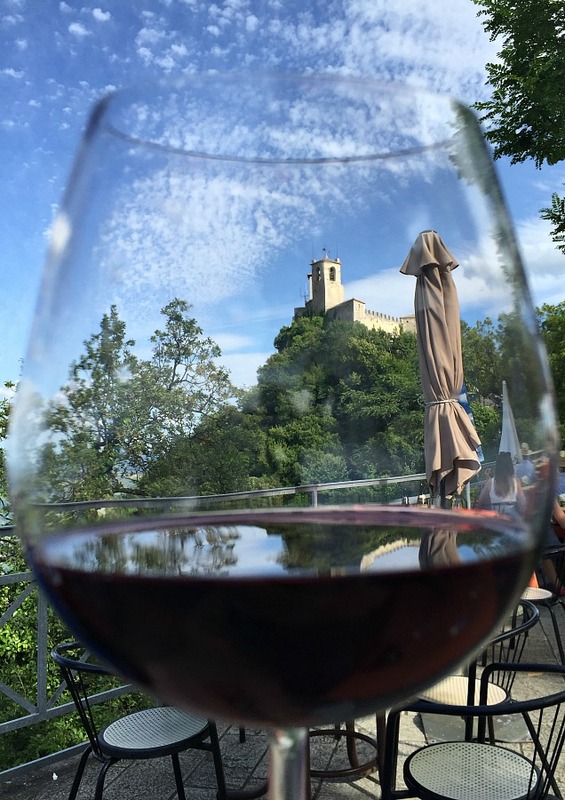 The way that wine is made is San Marino says a lot about the values of the community. Grapes are grown by farmers and collected by the single wine consortium. The grapes are processed and fermented by the consortium, who are also responsible for maintaining standards of quality for the wine and then distributing and marketing the results. Instead of valuing competition, Sammarineses (as the citizens call themsleves) prize cooperation and spreading the wealth. Part of that wealth is enjoying an inexpensive quality wine. 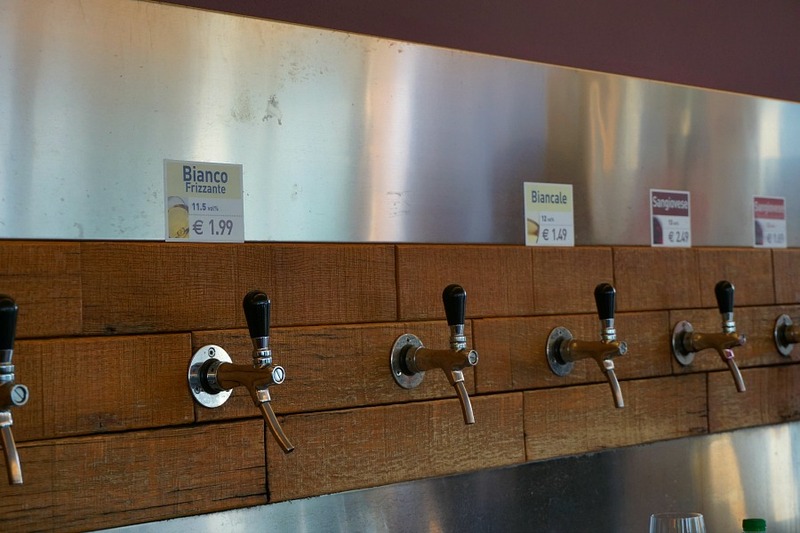 Simply visit the wine consortium and take home a jug for about $2. Are you seeing why we liked it here so much? 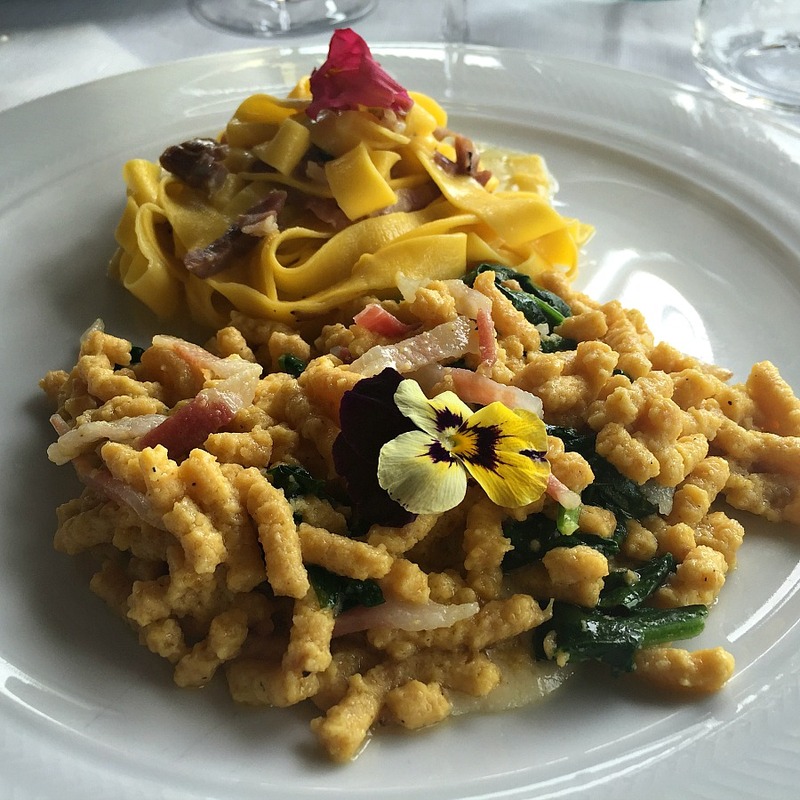 The cuisine of San Marino reflects that of the (literally) surrounding Emilia-Romagna and Marche. 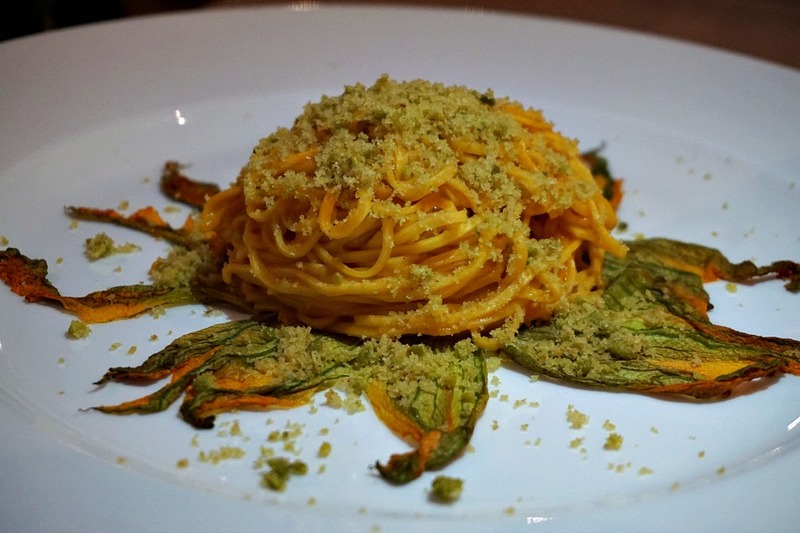 You can find the typical pasta and pizza dishes that you would expect. But, what you might not anticipate on the top of this rugged mountain is a restaurant boasting a Michelin Star, Ristorante Righi. 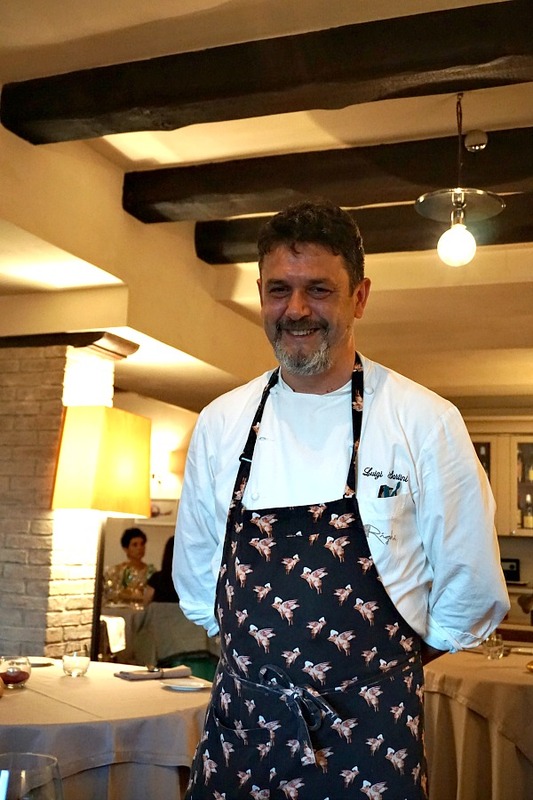 The Chef, Luigi Sartini, has prided himself on making regional dishes – but elevated to a new level. 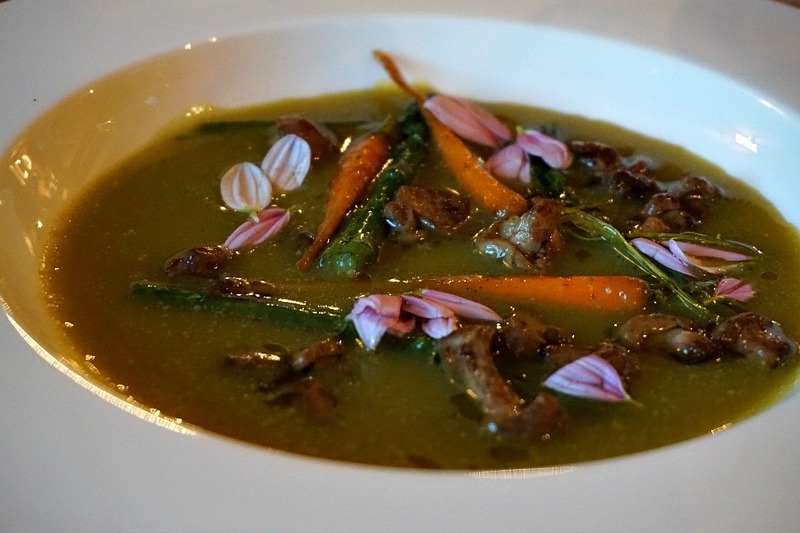 Best of all, the Chef is known to stroll through the dining room to personally greet his guests. 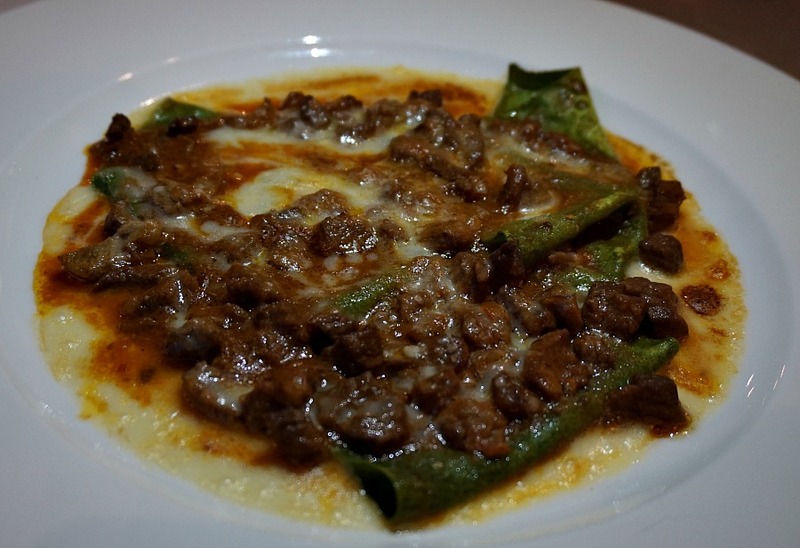 Another good choice where you can find dishes popular with the locals is La Terrazza. So named because of its location perched on the hillside. During a time when international politics are so explosive (and, when aren’t they somewhere? 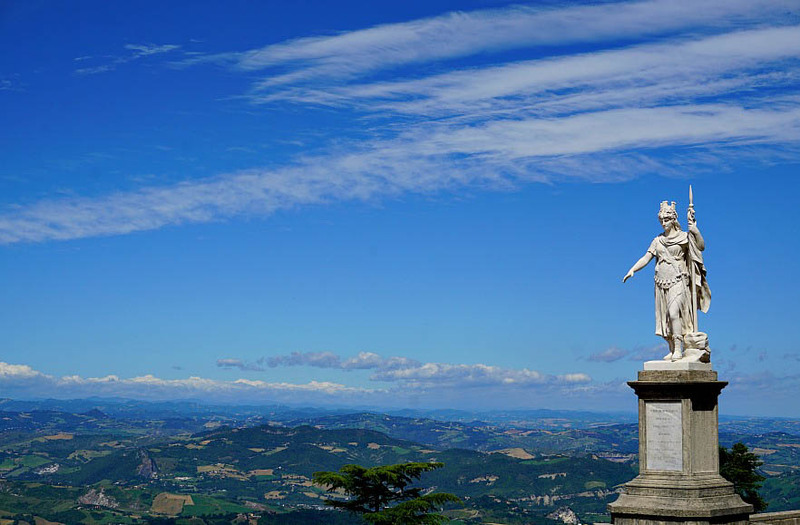 ), the politics of San Marino are a relative breath of fresh air. Every six months two Captain Regents are elected that act as the co-heads of state. The idea is to maintain a balance of power and diminish the potential for corruption. So far the multi-party system seems to be working. 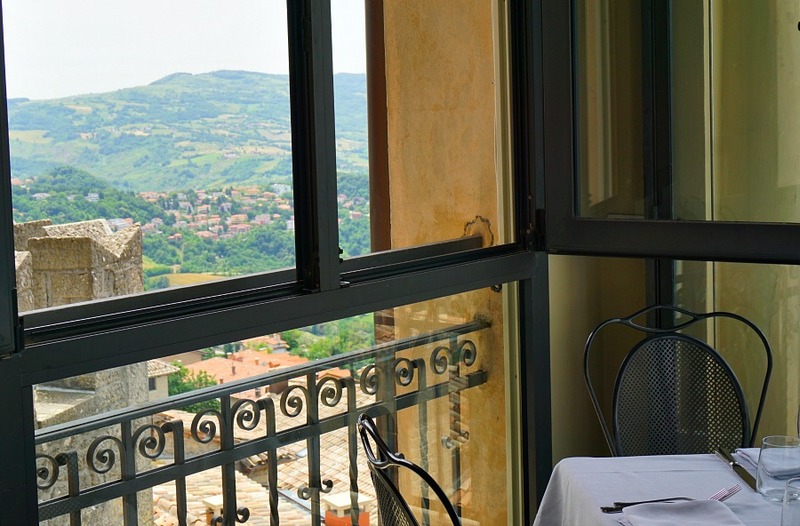 San Marino boasts a budget surplus and has a higher per capita income than its Italian neighbors. In addition, it has the lowest unemployment rate in Europe, has no national debt and a low taxation rate. It’s the only place in Europe where cars outnumber citizens. 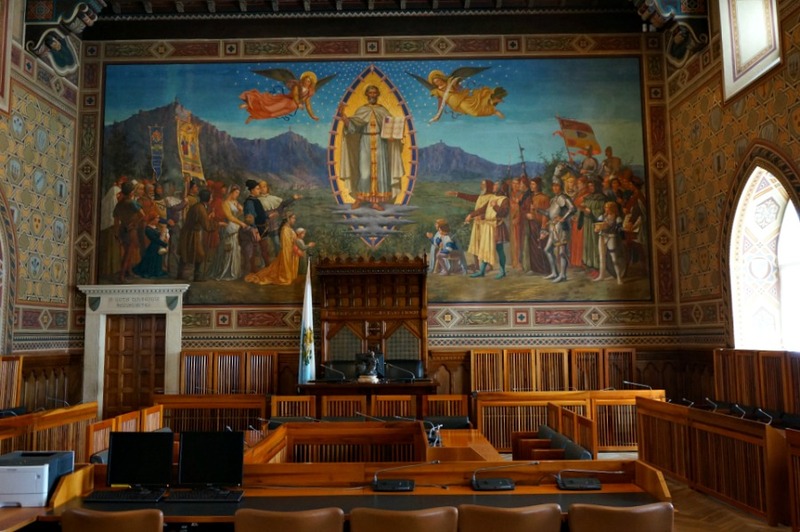 Many years ago Abraham Lincoln recognized the virtue of San Marino, and was made an honorary citizen when he wrote a letter to the council praising them. Maybe we can all learn something here? If you have ever considered skipping a destination due to concerns about your safety, put those concerns aside here. The crime rate is so low, that San Marino’s mini jail complex (of less than a dozens cells) has never been full. The most danger you might experience here is from crossing the street. And, in order to curtail any potential vehicle vs. pedestrian meeting, the community has installed this guy, who I call “the most serious man in San Marino.” The civil servant, with an ever present stern look through mirrored sun glasses, ensures that you get across the main street safely. You can rest assured that your biggest safety risk (beyond drinking too much wine and becoming overfilled at lunch) has been removed. The historic city center is packed with little shops selling everything you can imagine. Including plenty of shops filled with weapons of all sort, sprung from a celebration of the country’s legendary bowmen. My favorite souvenir comes in the edible form. 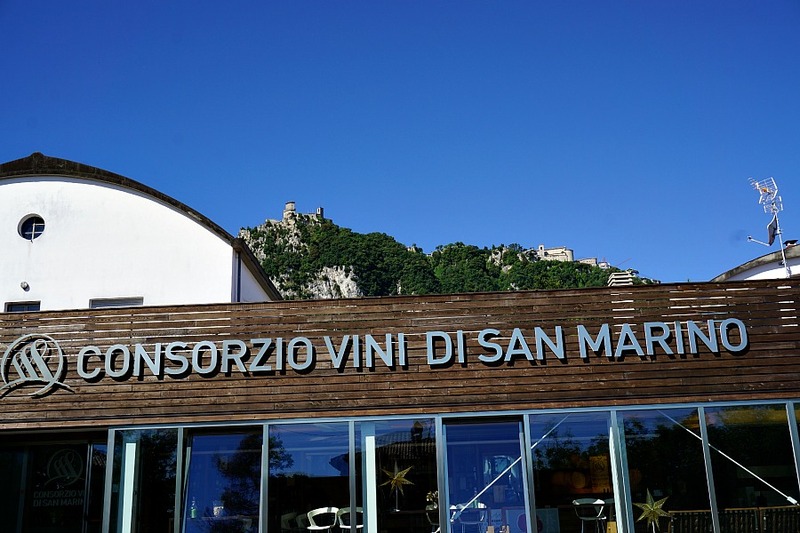 San Marino has its own premium standards for its products, ranging from artisan wine, honey, sweets and olive oil. 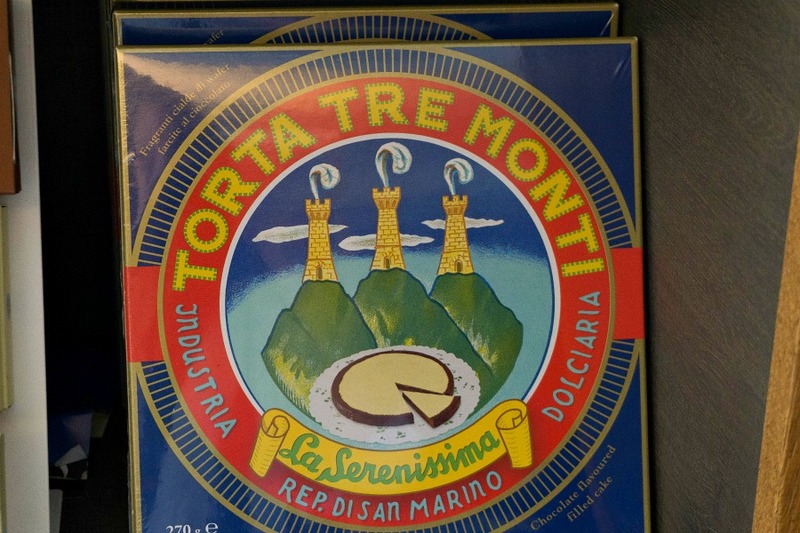 You can recognize it from the prominent three pillars displayed on the label. There are plenty of indoor places to explore, but my favorite is to find interesting art in outdoor public places. You will undoubtedly run into a coat of armor during your exploration, but there are also examples of more modern sculptures along with statues memorializing times of sadness and glory. A most prized statue is in the public square. Here San Marino’s Statue of Liberty dominates the plaza. 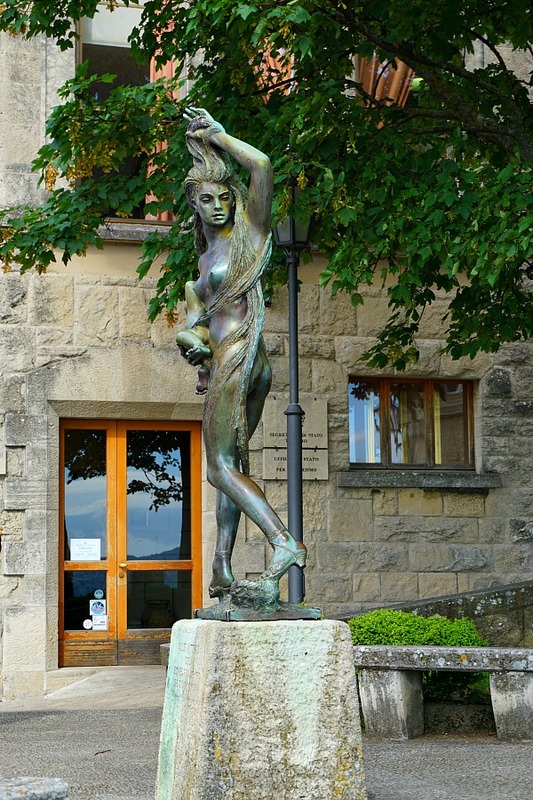 The statue was donated by Countess Otilia Heyroth Wagener from Berlin as a symbol of freedom in 1876. If you look closely you will see that her crown is adorned with the three pillars of San Marino. Another dramatic statue nearby is a WWII memorial to the casualties from the accidental bombing of neutral San Marino by the British Royal Air Force. There are plenty of museums to explore during your visit. From historical museums, like the Museum of Antique Arms, to those that are a little more peculiar, such as the Museum of Curiosities and the Museum or Torture. But our favorite museum was actually just outside of the city center. 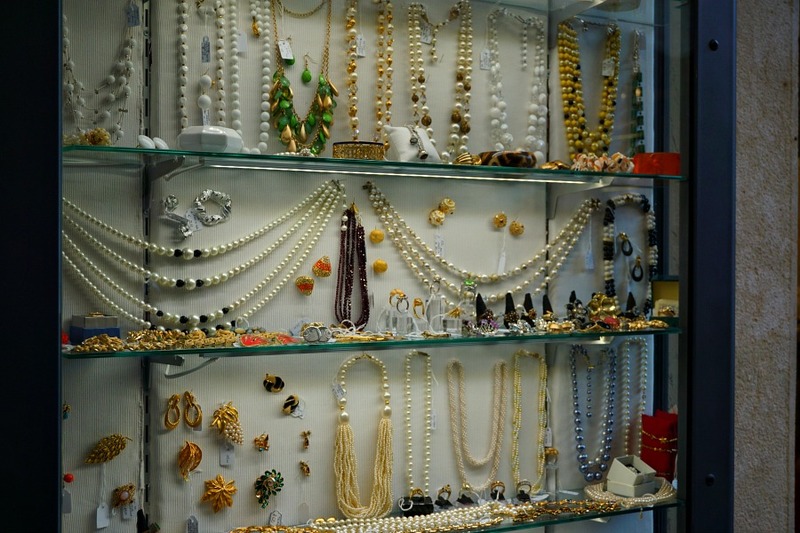 The Museum of Agricultural Culture and Traditions is a collection of antiques lovingly brought together by the community to preserve their heritage. 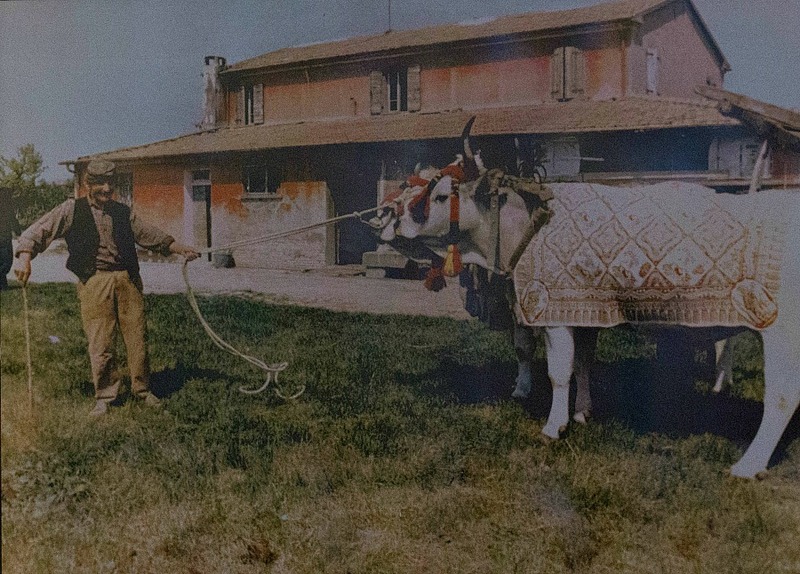 Many of the items in the collection were actually owned by the curator’s family, and show what it was like to live in San Marino before the advent of modern machinery. Wading through the areas showing how cloth was woven by hand, decorated and used to cover the prized family oxen was one example. Just imagining the chores ahead every day was staggering. And many of the old antiques from earlier times have not survived as families have discarded old objects when new less labor intensive tools came around. The curator is very passionate about his collection and spending a few hours with him is well worth finding your way down the hill to his doorstep. There are many opportunities throughout Europe to join a growing trend of agrotourism. You can spend part or all of your holiday living in a farm setting and sample local products, with locals. San Marino is no exception. The Agriturismo Podere Lesignano is an active farm and vineyard with a beautiful well appointed B&B. 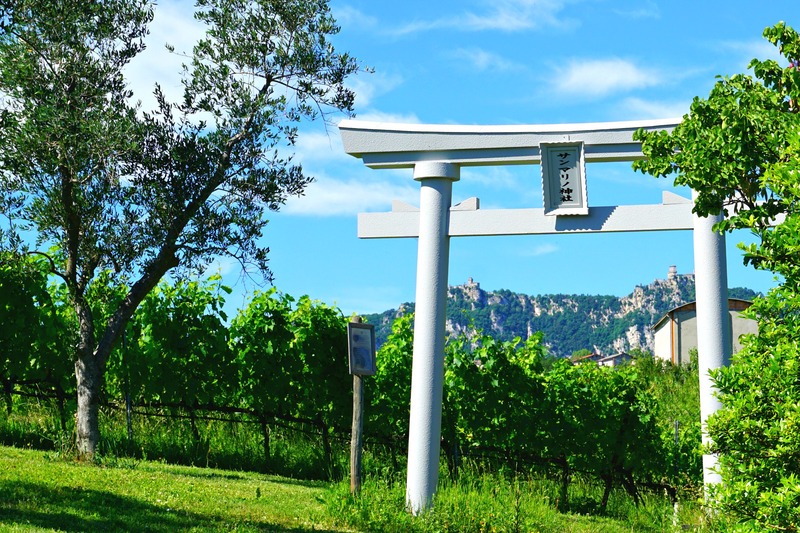 Stroll through the vineyards and get a glimpse of the three tours in the distance, complete with a meditation area surrounded by nature. 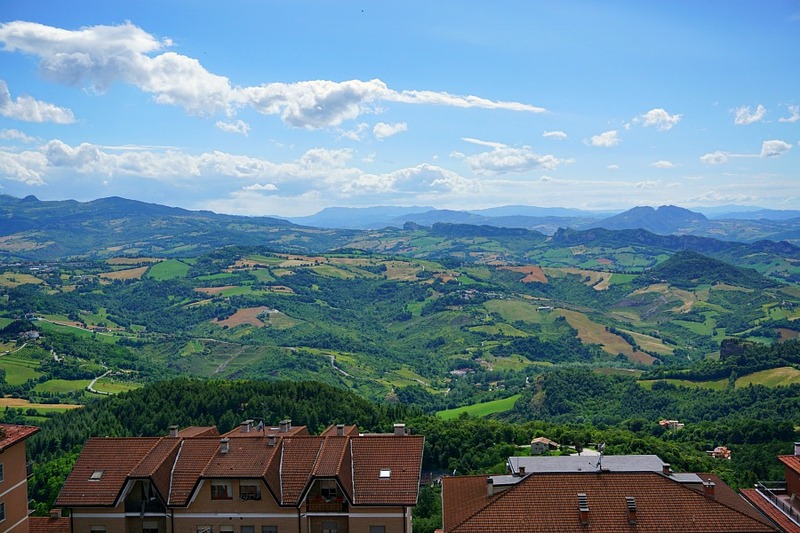 San Marino’s location in by the coast in Northern Italy makes it easily reachable by other popular destinations. 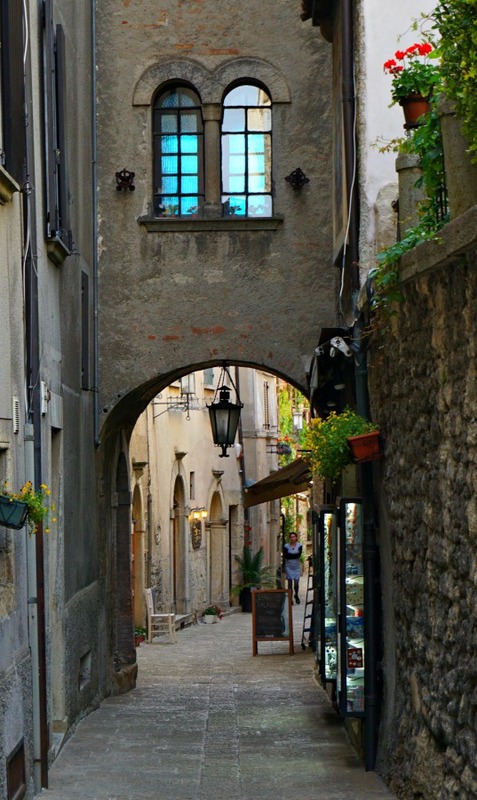 It’s about a 30 minute bus ride from to the seaside city, Rimini, which has its own historic center along with a nice sandy beach from which to laze away a day. From there you can reach Bologna in 1 hour by train, and Florence in another 35 minutes. From Bologna you can reach Milan by train in about an hour and Venice in an hour and a half. Find your best route by train, bus or car sharing, try Rome to Rio. If you do decide to stay over, this is the view that could await you in the morning (this one from our room in the lovely Hotel Joli). You can also enjoy a quiet evening strolling the quiet streets when all the day tourists have rushed off. And, best of all, you might get lucky and enjoy a spectacular sunset. During your visit, follow the signs in the city center to track down the Tourist Office. Here, for a few bucks, you can get your the best souvenir from your visit: this carefully placed, coveted, and coolest ever stamp in your passport. You know you need one, right? Considering a visit? 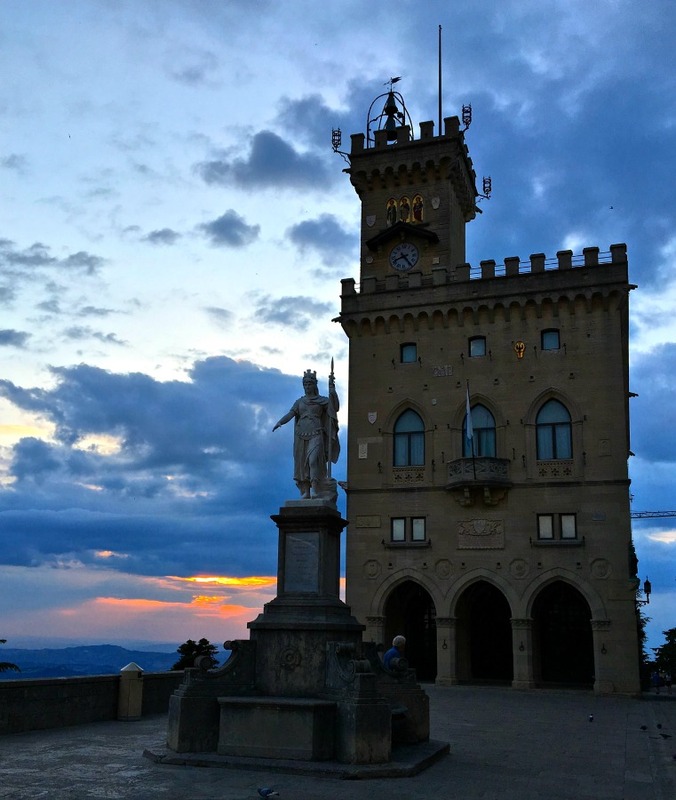 Read our other articles about travel in neighboring Italy or visit our Resources section for our recommendations about how to travel less expensively and more comfortably that we’ve learned after two years of full-time travel. A special thank you to the San Marino Tourism Board, who sponsored our time in their beautiful country. Our opinions, as always, remain our own. 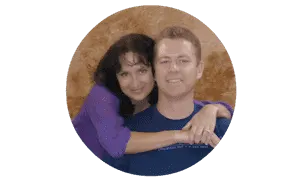 Note: Some of the links on this page are affiliate links, which means that if you click on them we may receive a small referral fee. So click away! And thank so much if you do, we sincerely appreciate the support. Very cool! 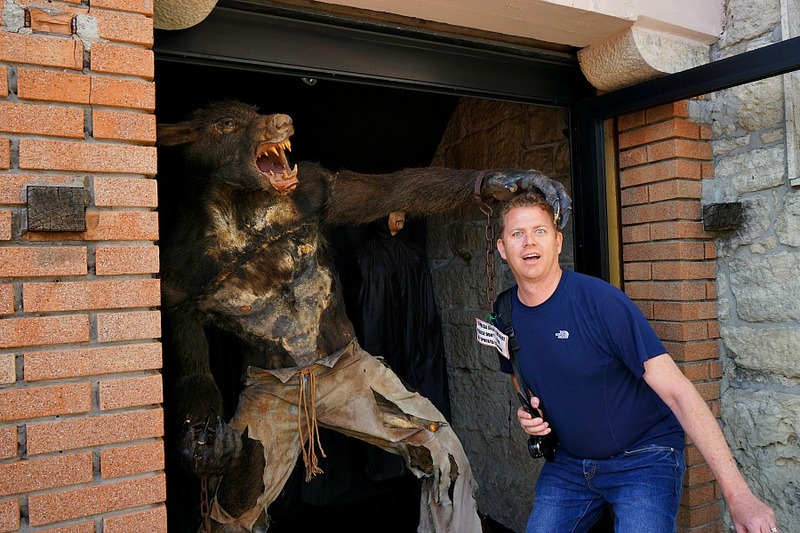 I’d love to make it there (especially for the Vampire Museum! ), but not sure that will happen. I’ve done northwest Italy and very much need to get to Rome. Not quite sure if I’ll make it to the part of Italy. Very informative! 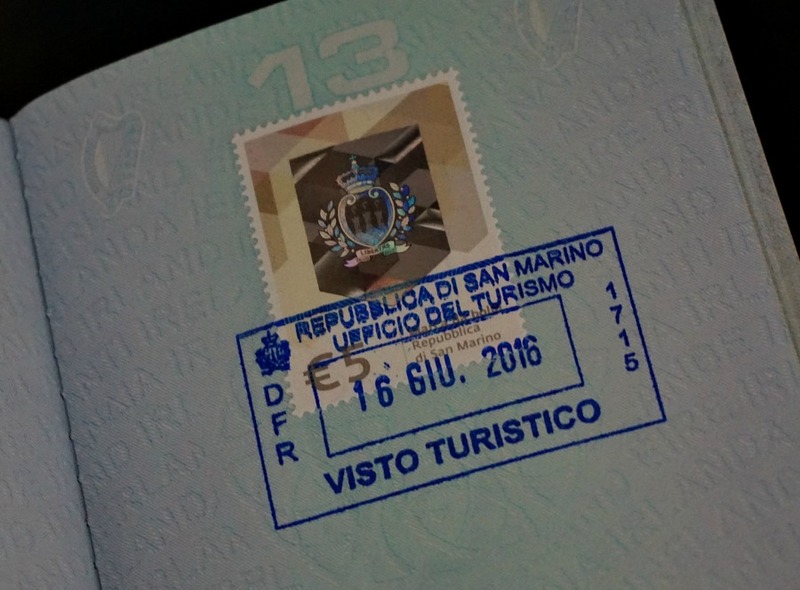 San Marino is now on my travel list. You will have a fantastic time – such a beautiful place! So curious about this destination!